www.photomacrography.net :: View topic - Nikon CFI Plan Fluor 4x 0.13 or Mitutoyo M Plan APO 5x 0.14? Nikon CFI Plan Fluor 4x 0.13 or Mitutoyo M Plan APO 5x 0.14? Posted: Sat Apr 22, 2017 12:17 pm Post subject: Nikon CFI Plan Fluor 4x 0.13 or Mitutoyo M Plan APO 5x 0.14? I'm considering buying a good 4x-5x objective in the $400-$500 range. I am currently satisfied with the quality of my Nikon CFI Plan Fluor 10x 0.3 attached to a Canon EF 70-200m f/2.8 IS II. This is why I'm considering its little brother Nikon CFI Plan Fluor 5x 0.13, hoping for similar good results. While I like Mitutoyo's longer working distance, I am more inclined to pay for sharpness. I can manage the 16mm WD of the 10x Plan Fluor, therefore I believe I'll be OK with the 17.1mm of the 4x Plan Fluor. Will the slightly more expensive Mitutoyo come with better sharpness AND longer WD, or only with longer WD? I'll appreciate your advice and recommendations. If you are not using a full frame camera you may consider nikon cfi plan apo 4x/0.20 which is superior to both mitutoyo and nikon fluor.It has a wd of 15.7mm and if you are a bit patient you may find it on ebay near 500$. Do you mean the Infinity version ov the lens or the 160 type? Do you know which one is best to work with? CFI is the latest infinity version.I don't have the finite 160 version but i have a lot of infinity 4x and 5x objectives (mostly plan fluors:olympus mplanfl 5x/0.15,nikon tu plan fluor 5x/0.15 ) but nikon plan apo 4x beats thems all. Camera format is not an issue, I can use both. Nikon CFI Plan APO 4x/0.20 would be the ideal solution, I guess. But a rather expensive one. This is the same objective Levon Biss used for his insect art gallery. When I bought it, my thought process was: if it is good enough for those huge posters, it should also be good enough for me . See photo from his YouTube post. Similarly if its little 4x brother offers similar sharpness, it should be good enough for what I want. If this info is not available I guess I'll flip a coin and take my chances! you will find out that a lot of nikon cfi 4x plan apos were sold under 500$.it is a matter of patience to find one. Off course nikon 4x plan fluor will be also a good choise.Same quality objectives are nikon TU or LU 5X/0.15 plan fluors or olympus mplanfl 5x/o.15.They all have a higher N/A than nikon 4x plan fluor. So when we see an objective claiming 0.15 @ x5, it might be slightly inferior to 0.13 @ x4. Is your assessment based on experience? Do you have a link to some tests? Where this graph is coming from and how a 4x/0.13 is equivalent to a 5x/0.16? See here what numeric aperure is and how is connected with objective's resolving ability. As far as concern my recommendations these are a from personal experience since i have tested all lenses mentioned in my posts. Excellent! Thanks for the confirmation! Can we expect this one to be closer in terms of sharpness as his Plan APO brother or at least similar to the other two options you offered me? The words "equivalent" and "inferior" are misleading here. "Equivalent" probably comes from the concept of "equivalent aperture", meaning how large the aperture appears to be from the standpoint of the sensor. 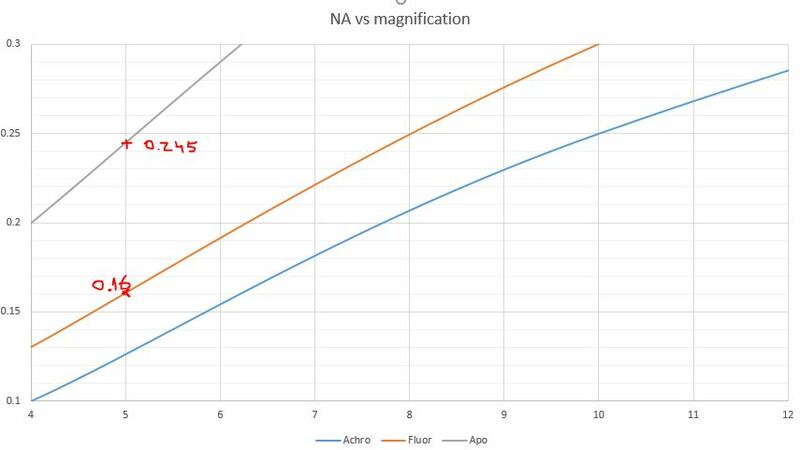 In that very restricted sense, the equivalent aperture is always magnification/(2*NA), so NA 0.13 @ x4 looks like f/15.385, 0.16 @x5 looks like f/15.625, and 10X NA 0.30 looks like f/16.667. All of these f/# "equivalent apertures" are close to the same, so you could expect that all of the images would be equally sharp on sensor. However, on subject there will be very large differences in sharpness. The 10X NA 0.30 objective will resolve details that are about 2.3 times smaller than the 4X NA 0.13 (because 0.30/0.13 = 2.31). In exchange, the 4X objective covers an area that is 6.25 times larger than the 10X objective does (because 10/4=2.5, 2.5*2.5 = 6.25). These numbers are very far from "equivalent". Likewise 0.15 @ x5 will be substantially sharper on subject than 0.13 @ x4, so calling it "inferior" strikes me as misleading. I submit that when you are doing stack-and-stitch, what you want is the highest image quality on subject that you can afford to capture. This means that there is a tradeoff between coverage and NA. If you cannot afford to capture the whole subject using 10X NA 0.30, then you might prefer to drop back to 7.5X NA 0.21 (Mitutoyo M Plan Apo), or down to something at 5X, or even at 4X, accepting the lower resolution on subject in exchange for having to shoot fewer tiles, each containing fewer frames. 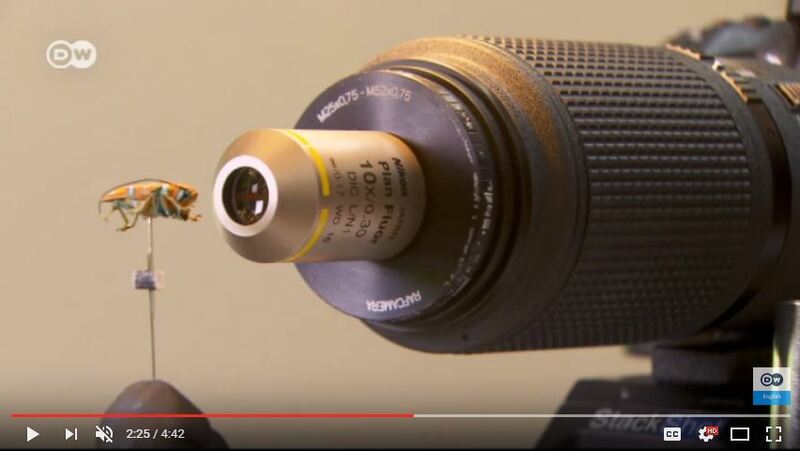 If an infinity objective covers a large enough area with high quality image, then you can also use it at less than rated magnification but same NA, by pairing it with tube lenses that are shorter than 200 mm. On APS-C, I regularly push my Mitutoyo M Plan Apos down to half their rated magnification by using them on a 100 mm tube lens. That gives me 10X NA 0.42 (using the "20X NA 0.42" objective) or 5X NA 0.28 (using the "10X NA 0.28"). The Mitutoyo 20X and 7.5X are unusually good at covering large areas, having been tested to cover even a 56.7 x 40.4 mm PhaseOne sensor with high quality image at rated magnification (test report at http://www.photomacrography.net/forum/viewtopic.php?p=208235#208235). As for Mitutoyo M Plan Apo versus Nikon Plan Fluor, I am not aware of publicly available direct comparisons. From what I have seen, I lean toward Mitutoyo. The Mitutoyo objectives are true apochromats, almost completely free of false color even in out-of-focus areas. In addition they cover quite large areas with high quality image, so they work well at reduced magnification with short tube lenses. I have not seen test results for that technique using the Nikon Plan Fluor. In addition I know that Visionary Digital (now Dun Inc) used to supply Nikon Plan Fluor objectives with their systems, but after extensive testing, they now prefer Mitutoyo. See for example http://www.duninc.com/dun-inc-microscope.html . In my experience the Mitutoyos fully exploit their NA, so in comparing Nikon's NA 0.13 with Mitutoyo's NA 0.14, I think the answer to your question is that yes, the Mitutoyo comes with both better sharpness and longer WD. I suggest also to consider the Mitutoyo 7.5X NA 0.21, used with shorter than 200 mm tube lens so as to push it down into the 5X range, but I have not personally confirmed that that combination works well. Note that the Mitutoyo and Nikon objectives have different parfocal distances, so it will be a little simpler to switch magnifications if you say within the same family. One concern about purchasing objectives on eBay... The internal elements of high quality objectives are easily knocked out of alignment by being shocked or dropped. This can produce no visible damage on the outside, but significantly degrade the image quality. See for example the discussion and comparison images at http://www.photomacrography.net/forum/viewtopic.php?t=20594 . Whatever you purchase, be sure it comes with return privileges, and test it carefully with a familiar subject and known good objectives before accepting it. Excellent answer, thank your for all details! Maybe my choice of words was not optimal, but this is what I meant by "equivalent", indeed. In a way, this is the same as comparing sharpness for a 200mm lens vs a wide angle 16mm lens. Both can have "equivalent" sharpness, but the 200mm lens will obviously "resolve" a lot more details. To obtain the same coverage as with a 16mm lens, one would need a lot frames stitched on a massive panorama. That panorama will have mind-blowing details! However, this setup doesn't properly cover a full frame sensor, not even @ 200mm. And if I may (see my question above), speaking about the power to resolve details: with a 0.20 NA, should I expect a Nikon Super Fluor 4x/0.20 to compete in terms of sharpness with the solutions recommended here? I appreciate your expertise and kindness in sharing your knowledge! CFI Super Fluor Series objective lenses provide the highest ultra-violet transmission, exceptionally high N.A.s, and terrific chromatic correction. Thanks to outstanding transmission below 340nm, Super Fluor objectives are the ideal choice for fluorochromes like indo-1, fura-2, and fluo-3. Also, these objectives have improved signal-to-noise (S/N) for short wavelengths, due to low auto-fluorescence materials, and have high N.A., making the fluorescence images they produce significantly sharper and brighter. They are also a great choice for photo-activation of caged compounds. I like the "exceptionally high N.A.s, and terrific chromatic correction". I'm giving it a shot, for a bargain price, from the same seller I got the my Plan Fluor x10/0.30. He offers 30 days money back guarantee. I'll share my findings, as soon as I get to test it. The CFI 4X S Fluor lacks the designation ''plan''.This may indicate a poor correction for field flatness which in turn may be restrictive for microphotography. I have never came across a photo taken with this lens so please let us know how it performs. I believe this can be a problem if the goal is to have a flat surface, in focus throughout the whole frame, at once. However, for complex 3D specimens (e.g. insects), using focus stacking, the edges of the frame should eventually come into focus, after a few extra steps. I expect a stack to turn-out sharp in the end. Maybe I'm wrong, hopefully not. I will see next week. Delivery expected on Monday. Fingers crossed!